“Nice to meet you. I think I’ve covered wars with fewer people,” said Tom Brokaw as our camera crew set up in the living room of his winter home on the Gulf Coast of Florida. Cable news was on the television, and at 79-years-old, six years into cancer, Brokaw’s legendary charm is still mixed with a splash of vinegar from the old school newsman. He is a living testament to the extraordinary advances in treatment which are increasingly turning some cancers such as multiple myeloma into chronic diseases. He’s on a drug called Revlimid which, in combination with other therapies, is used to kill myeloma cells. Brokaw is now in what’s called the “maintenance phase” of treatment in which lower doses of Revlimid (also known by its molecular name lenalidomide) are used to keep the immune system on high alert against the cancer. “Lenalidomide prolongs progression free survival, in fact, doubles time without myeloma,” one of Brokaw’s physicians, Dr Ken Anderson of The Dana Farber Cancer Institute, tells SurvivorNet. The drug works by helping to stimulate the immune system and block the development of abnormal cells. Brokaw says he is “keenly aware” that most people with a cancer diagnosis are not as fortunate. When he feels sick, he can pick up the phone and call some of the best cancer doctors in the world, and he can afford the best drugs. “When I see people with multiple myeloma they stop me and I ask them what they’re on? It’s sort of like a club,” says Brokaw who cares deeply about his fellow travelers on the myeloma journey. He urges cancer patients to be informed and advocate for themselves, and believes there is a real information gap for people dealing with cancer. Brokaw also thinks there ought to be a central resource for patients and a doctor rating system of some kind to help with decision making. So as his 80th birthday approaches, what does he want to do? 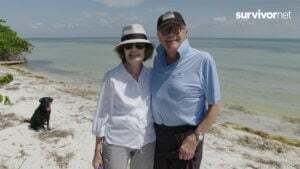 Brokaw says he wants to write, travel, do some TV, work with multiple myeloma organizations… basically, he just wants to keep living his life. He is very grateful. (Multiple myeloma is not curable but it is treatable. SurvivorNet has collaborated with the world’s leading clinicians and researchers to provide extraordinary resources for patients with this cancer and others. You’ll find the multiple myeloma section of our website here: https://www.survivornet.com/journey/multiple-myeloma-initial-treatment/). What Role Do Diet and Exercise Play During Treatment?